The Recanati and Arezzo Families. An ancient Italian family, which probably derived its name from "Pineḥas," through the Latin "Finea." The remotest known bearers of the name of "Finzi" were Musetino del fu Museto do Finzi di Ancona, who was concerned in establishing the first Jewish money-lending office in Padua in 1369, and his sons Emanuel, Solomon, and Cajo, who bought real estate in 1380. Cajo is probably identical with the Isaac ben Moses Finzi who represented his congregation at the congress in Bologna in 1416. He seems to have been a scholar, for in a document of 1389 he is styled "magister gayus." A Bible manuscript (Cod. Asher, No. 2) belonging to Solomon contains the genealogy of the Finzi family. After his death in 1421 the manuscript came into the hands of his son Abraham (d. 1446), and after him into the possession of his son Mordecai, a physician, who flourished at Mantua (1440-75), and who was distinguished also as mathematician and astronomer. The library of Turin contains many of his manuscripts. His astronomical tables were published at Mantua under the title "Luḥot, Tabulæ Longitudinis Dierum," probably before 1480. He also wrote glosses to Efodi's Hebrew grammar, "Ḥesheb ha-Efod." Joseph Sarka, Efodi's pupil, was hospitably received by the Finzis at Mantua. Judah Finzi, of Bologna: In 1399 he arranged the sale of a Bible. Benjamin Finzi, of Piacenza: Founder of a banking-house at Fano in 1439. Judah ben Moses Finzi: Author of a commentary on Mordecai Finzi's "Seder Mo'ed," written at Ferrara in 1457 (Neubauer, "Cat. Bodl. Hebr. MSS." No. 1065). Isaac Finzi da Ascoli: Corresponded with Joseph Colon (Responsa, No. 171). Abraham Raphael Finzi da Bologna: Promoter of Hebrew literature, who had a copy made of a manuscript, now at Oxford (No. 1229) and of MS. De Rossi, No. 1418; in 1449 he procured Codex Benzion 18. Hananiah Finzi ben Solomon, of Gazuolo near Mantua: Rabbi and poet. He was part owner in 1587 of a printing-office at Venice, which issued the second part of the Maḥzor Romi; his poems are contained in the collection "Kenaf Renanim." David ben Uzziel Finzi: Rabbi at Mantua in 1721. His sermons, entitled "Shetaḥ ha-Ohel," of a cabalistic character, are still in manuscipt. In 1682 he procured the manuscript now known as Oxford No. 1403. He was the father-in-law of Moses Ḥayyim Luzzatto. Solomon ben Eliakim Finzi: Rabbi at Forli in 1536; he was the author of "Mafteaḥ ha-Gemara," reprinted in the collection "Tummat Yesharim" (Venice, 1622). It was republished in Bashuysen's" Clavis Talmudica Maxima," with a Latin translation and notes by B. Rittmeier (Hanau, 1714). He also wrote a dissertation on the proper names in Gen. xxv. 13-15. Moses Finzi: Translator from Hebrew and Arabic. He translated into Latin Moses ibn Tibbon's Hebrew version of Themistius' commentary on the twelfth book of Aristotle's "Metaphysics" ("Themistii Paraphrasis in Duodecimum Librum Metaphysicæ Aristotelis ex Interpretatione Hebraica Latine Versa," Venice, 1558-76), and translated into Hebrew Abu Kamit's "Algebra." He is probably identical with Moses ben Israel Finzi da Arezzo. Ḥayyim ben Jacob ben Judah Finzi da Forla: Physician and rabbi at Pesaro and Ancona. At Pesaro, in 1581, he wrote a commentary on the Psalms, called "'Eẓ Ḥayyim" (Neubauer, l.c. No. 2318). He was a pupil of Isaac ben Gershom. Treves. David Finzi, of Mantua: Possessed a collection of ancient coins, of which Azariah dei Rossi made use in his studies. Abraham ben Foa, of Ancona: In 1455 he had a copy of the "Libnat ha-Safir" made by Messer Leon, rabbi at Mantua. Jacob ben Menahem: Was teacher of Gedaliah ibn Yaḥya, author of "Shalshelet ha-Ḳabbalah." Jacob Israel ben Raphael: Rabbi at Pesaro (1540-60); corresponded with Moses Provençal and Nathaniel Trabotti, and criticized Azariah del Rossi's chronology; the latter defended himself in "Ma'amar Ẓedeḳ 'Olamin." The Da Arezzo branch of this family is identified chiefly with Ferrara, and among its members were Joab Emanuel and his cousin David. The latter in 1477 had a copy made of MS. Bodl. No. 2183. To the same family belonged Israel Finzi da Arezzo, owner of MS. Bodl. No. 656 ("Shibbole ha-Leḳeṭ"). His sons were: (1) Aaron ben Israel, rabbi at Ferrara about 1575. His responsa (MSS.) are in the Collegio Rabbinico Italiano. (2) Moses ben Israel, rabbi at Imola and Ferrara. To a parallel line belong: Benjamin da Arezzo (1500). Eliezer ben Benjamin: Rabbi at Forli in 1536. Ephraim and Benjamin ben Ephraim, both of Ferrara: Their decisions are contained in a manuscript owned by the late David Kaufmann of Budapest. At Cremona about 1586 David Finzi and his son Ishmael ben David da Arezzo were heads of the Talmudic academy. To this branch belong the Finzis of Ferrara and Tuscany. One of the greatest Talmudists of his time was Hezekiah ben Benjamin Finzi of Ferrara, teacher of Leon da Modena. 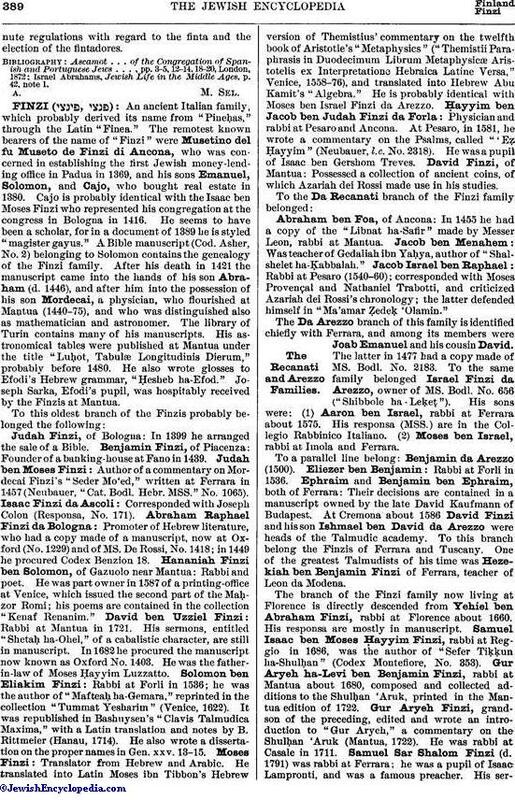 The branch of the Finzi family now living at Florence is directly descended from Yehiel ben Abraham Finzi, rabbi at Florence about 1660. His responsa are mostly in manuscript. Samuel Isaac ben Moses Ḥayyim Finzi, rabbi at Reggio in 1686, was the author of "Sefer Tiḳḳun ha-Shulḥan "(Codex Montefiore, No. 353). Gur Aryeh ha-Levi ben Benjamin Finzi, rabbi at Mantua about 1680, composed and collected additions to the Shulḥan 'Aruk, printed in the Mantua edition of 1722. Gur Aryeh Finzi, grandson of the preceding, edited and wrote an introduction to "Gur Aryeh," a commentary on the Shulḥan 'Aruk (Mantua, 1722). He was rabbi at Casale in 1711. Samuel Sar Shalom Finzi (d. 1791) was rabbi at Ferrara; he was a pupil of Isaac Lampronti, and was a famous preacher. His sermonsare preserved in manuscript under the title "Imre Emet." Alessandro (Elisha) Michael Finzi, also a pupil of Isaac Lampronti, was in 1721 secretary of the rabbinical academy of Ferrara. Isaac Raphael ben Elisha Michael Finzi was born at Ferrara in 1728, and died at Padua in 1813. He was one of the most famous preachers of his time. Christians were often seen among his hearers. He was a member of the Paris Sanhedrin in 1806, and was made vice-president. His manuscripts are in the library of the Jews' College in London. Solomon Finzi was rabbi at Elba about 1800. He was the author of "Messia Verrà," a poem which resulted in his imprisonment on the charge of attacking Christian ministers. He was soon released, however, and afterward lived at Florence. 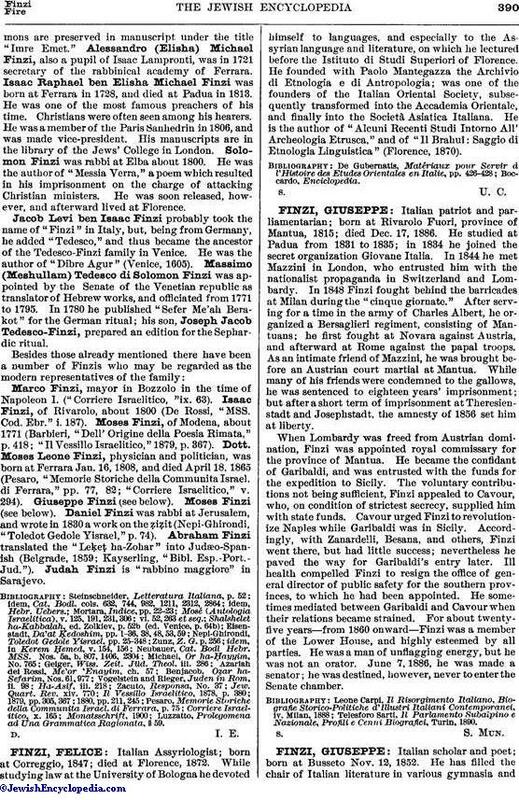 Jacob Levi ben Isaac Finzi probably took the name of "Finzi" in Italy, but, being from Germany, he added "Tedesco," and thus became the ancestor of the Tedesco-Finzi family in Venice. He was the author of "Dibre Agur" (Venice, 1605). Massimo (Meshullam) Tedesco di Solomon Finzi was appointed by the Senate of the Venetian republic as translator of Hebrew works, and officiated from 1771 to 1795. In 1780 he published "Sefer Me'ah Berakot" for the German ritual; his son, Joseph Jacob Tedesco-Finzi, prepared an edition for the Sephardic ritual. Marco Finzi, mayor in Bozzolo in the time of Napoleon I. ("Corriere Israelitico, "ix. 63). Isaac Finzi, of Rivarolo, about 1800 (De Rossi, "MSS. Cod. Ebr." i. 187). Moses Finzi, of Modena, about 1771 (Barbieri, "Dell' Origine della Poesia Rimata," p. 418; "Il Vessillo Israelitico," 1879, p. 367). Dott. Moses Leone Finzi, physician and politician, was born at Ferrara Jan. 16, 1808, and died April 18, 1865 (Pesaro, "Memorie Storiche della Communita Israel. di Ferrara," pp. 77, 82; "Corriere Israelitico," v. 294). Giuseppe Finzi (see below), Moses Finzi (see below). Daniel Finzi was rabbi at Jerusalem, and wrote in 1830 a work on the ẓiẓit (Nepi-Ghirondi, "Toledot Gedole Yisrael," p. 74). Abraham Finzi translated the "Leḳeṭ ha-Zohar" into Judæo-Spanish (Belgrade, 1859; Kayserling, "Bibl. Esp.-Port.Jud."). Judah Finzi is "rabbino maggiore" in Sarajevo. Luzzatto, Prolegomena ad Una Grammatica Ragionata, § 59.